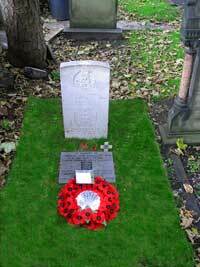 11 November 2005 -- On 11 November 2005, the chairman of the Association, Mr. Vincent McGough laid a wreath on the grave of 4119 Sergeant John O'Neill VC. MM. 2nd Battalion Prince of Wales's Leinster Regiment (Royal Canadians). Sgt. O'Neill won his VC on the 14 October 1918 during the fighting at Ledgehem, near Courtrai, Belgium. The Association was instrumental in recommemorating the resting place of Sgt John O'Neill on 31st October 2004. On the 13 and 14 October 1918 toward the end of t he Great War, as part of the 29th Division of the IInd Corps the 2 Battalion Leinster Regiment were fighting in the Ledeghem sector near Courtrai (Kortrijk) in Belgium. The Leinster Regiment were the advance troops of the 88th Brigade. On the morning of the 14th Sgt. O'Neill received news that his brother, a member of the 36th Ulster Division who was also fighting on the right of the Leinsters, had been killed in action. At the start of the days artillery barrage, presumably to avenge his brother, Sgt. O'Neill charged ahead of the barrage and led the Leinster attack being the first man in many enemy strongholds. In the village of Staceghem he teamed up with another sergeant from the 4/Worcester Regiment and between them commenced to clear several houses of enemy combatants. He was awarded the Victoria Cross for reckless gallantry. John O'Neill was born in Airdrie, Lanark and enlisted in to the Leinster Regiment at the age of 17. Within four years he had been honoured with the Military Medal, the Victoria Cross, Médaille Militaire , and the Légion d'Honneur. He also served in the RAF as an Armourer Sergeant when he served alongside Lawrence of Arabia and in the Pioneer Corps as Lieutenant O'Neill during WW2 (1941) defending Liverpool's docklands from air attack. John O'Neill died of heart attack on the 16 October 1942. He is buried in Trinity Road Cemetery, Hoylake, Wirral. The Prince of Wales's Leinster Regiment that served in the British Army for hundreds of years was disbanded as part of the economy cuts and downsizing of the British Army in 1922. For many years they became part of the forgotten Irish legacy of the British Army. Today there are many descendents of the men who served in the Leinsters who would like to see a more positive recognition of the part played by the disbanded Irish Regiments and in more recent years a number of individuals have developed initiatives to honour those soldiers. 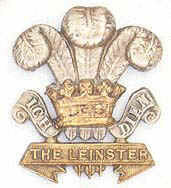 The Regimental Association of the Prince of Wales's Leinster Regiment was reformed in April 2003 principally through the efforts of David Ball, whose great uncle James Fay was a Leinster Soldier killed in action on the 12 August 1915, and with the support of the Combined Irish Regiments Association. The aims of the Association is to encourage all to honour the gallantry and service of all men who served in this Irish Regiment of the British Army, especially now as Irishmen of both North and South Ireland are beginning the process of reconciliation.